Located northwest of Augusta, near the village of Livermore Falls, Spruce Mountain is a small, multi-town-owned, volunteer run ski area. The Spruce Mountain Ski Club dates back to 1956, when a group of Livermore Falls skiers obtained permission from Eben Farrington, Carl Wright, and Everett Wright to develop a ski area off Spruce Mountain Road in North Jay. The ski club was registered as a non-profit in December of 1956 and a rope to acquired from Augusta. In the interest of having a more convenient location, the ski area was moved to a location just outside of Livermore Falls in 1959. Alex and Pauline provided their land and barn for the ski club's use, in exchange for a lease payment to cover their property taxes. Thousands of trees were planted in the early years to help define the ski trails on what was sometimes called Dion Hill. Like its predecessor, the ski area was rope tow serviced. The new location likely opened during the winter of 1959-60. While a lack of volunteer help threatened the ski area in the mid 1970s, the club was able to rebound, keeping the area in operation as it played host to numerous ski races and championships later that decade. Spruce Mountain was not immune from the poor winters of the early 1980s, as the club found itself asking the towns for help in paying down deficits. In December of 1987, the town of Jay entered into a purchase agreement with the Dion family for the property. Jay, Livermore, and Livermore Falls purchased the land and buildings for $197,000, retaining the Spruce Mountain Ski Club as operator. The deal likely closed in 1988 with the stipulation that Jay would continue to receive property taxes on the property. Relatively large projects were completed for the 1991-92 season, when the warming hut, snack bar, and garage facilities were upgraded. New bathrooms were also constructed. Losses accumulated as Spruce Mountain entered the mid 1990s. The ski area faced foreclosure due to $3,000 in back taxes owed to Jay. An agreement was likely reached in 1995. Also in 1995, the towns of Jay and Livermore and numerous volunteers joined together to build a new snowmaking system. New pipe was installed and a new pumphouse constructed, boosting the system's coverage to 8 acres. Improvements have continued since the 1990s. 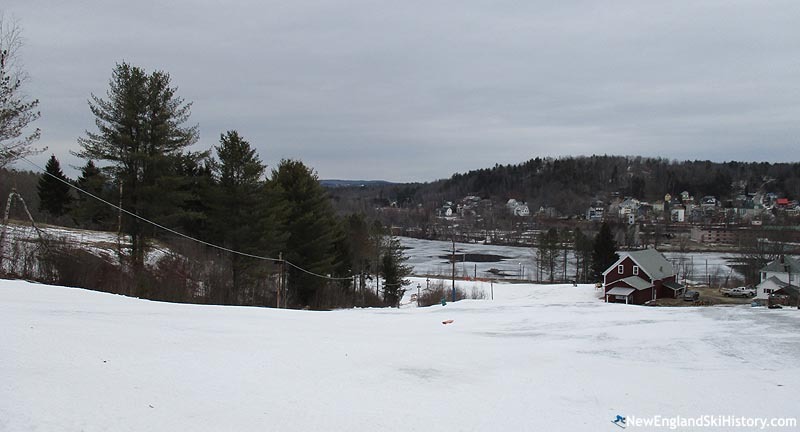 In the early 2010s, rope tow lines were smoothed and the Maine Army National Guard installed new drainage at the base of the ski area and parking lots. 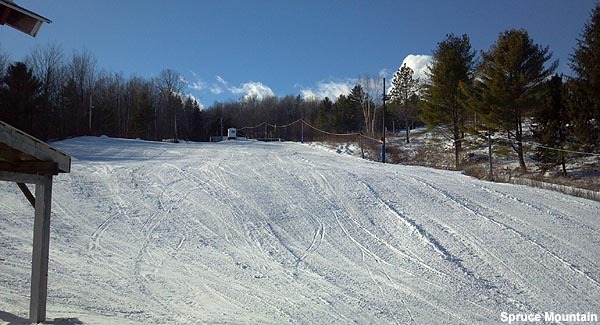 Spruce Mountain presently operates with three rope tows, 11 trails, snowmaking, night skiing, and grooming.